Decorate a luncheon or party table with a set of effusive pansy lights for a pop of pretty flair! 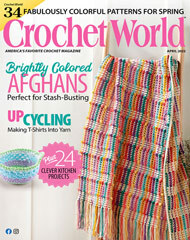 This e-pattern was originally published in the April 2012 issue of Crochet World magazine. Size: 2 1/2" diameter. Made with size 10 crochet cotton thread and size 5/1.90mm steel hook.